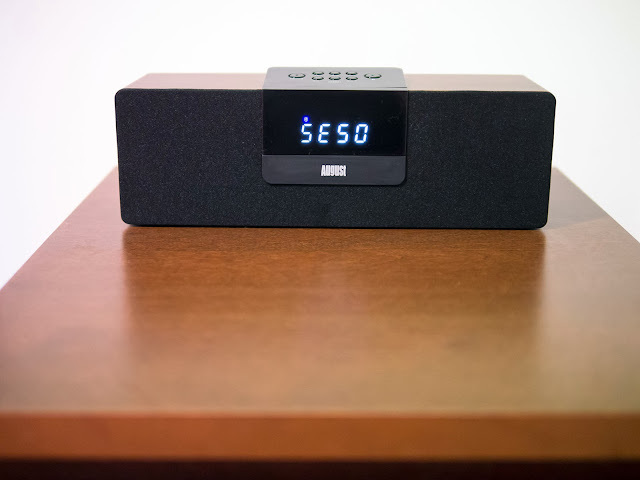 Oluv's Gadgets: Review: August SE50 - A 'Tivoli' costing only a fraction? Review: August SE50 - A 'Tivoli' costing only a fraction? August International sent me a sample of their new tabletop radio SE50 for a review. As I have heard lots of different radios, I thought I might give the SE50 a try, as it is a very inexpensive unit that even includes bluetooth streaming for under 40$. At the same time it is quite classy looking due to a faux-wooden design. In Germany you'll have to pay a little bit more, as you can find it on Amazon.de for around 45€. A comparable Tivoli One radio with bluetooth will cost you more than 200$ and you'll only get mono sound. Is the high price for the Tivoli really justified? Let's find out. 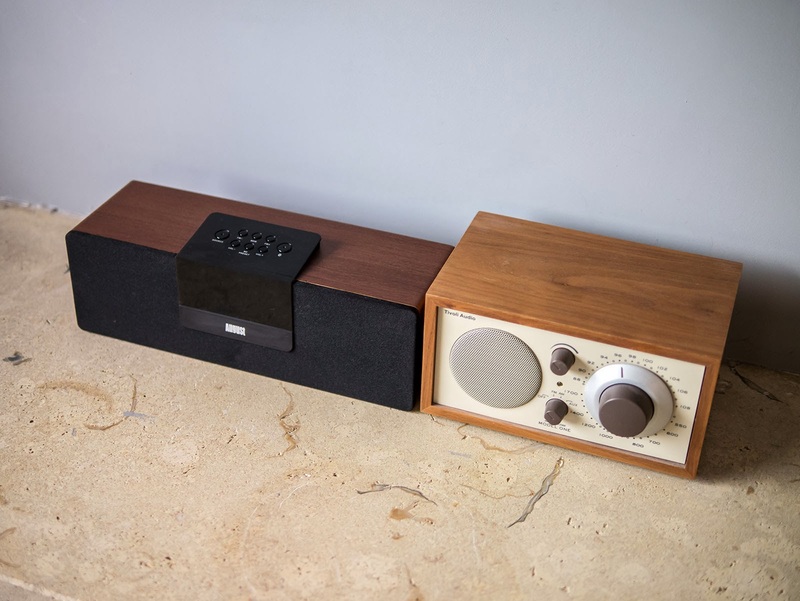 The SE50 came in a stylish but very simple box. There was only the radio, the power-adaptor and a manual inside, but August even included a 3.5mm Aux-wire, which is impressive for that price, as even Bose doesn't add any wires with their products that cost 5 times as much. The radio looks modern but classy at the same time. The main body is some kind of plastic with a wooden texture printed on (or maybe laminated). The front speaker cover (not removeable) is of a black cloth material. The display and the control panel at the top are glossy black. At the back there is also the auxilary-input, as well as the power switch and a bassreflex port. The display either shows "SE50" or the frequency of the radio station, if set to radio mode. It doesn't have any clock or alarm, which is a pity, but understandable because of the low price, but at least a simple clock would lift the SE50 to an even higher level. 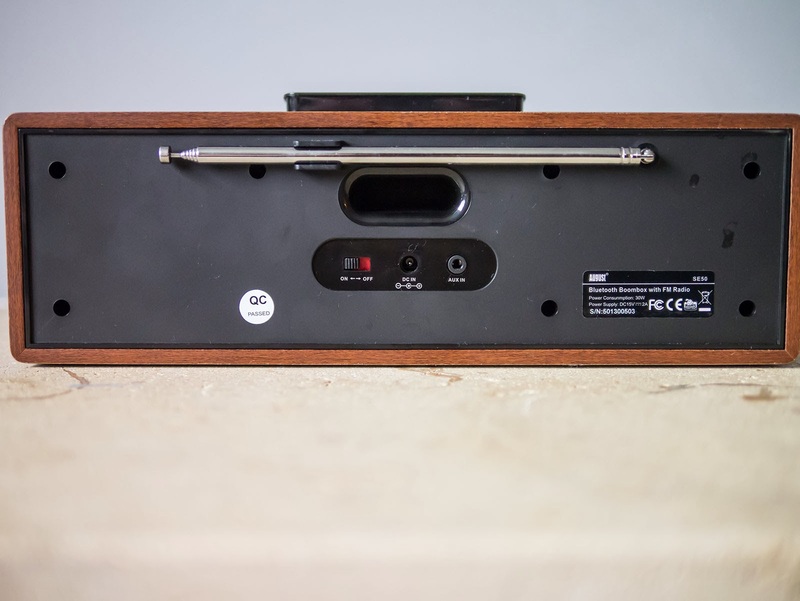 No idea why August decided to mount the power switch at the back, as usually it would be quite hard to reach, if you placed the radio inside a shelf or higher on a cabinet. But you can also just leave the radio switched on, and set to aux mode, in order to bring it into a kind of "fake-standby". All other operation is done from the top control panel. 2 buttons are bigger namely the source-button where you can switch between radio, auxiliary input or bluetooth. The other one is the bluetooth button, which forces the radio to jump into pairing mode. When you turn on the radio for the first time, it automatically starts in bluetooth mode. 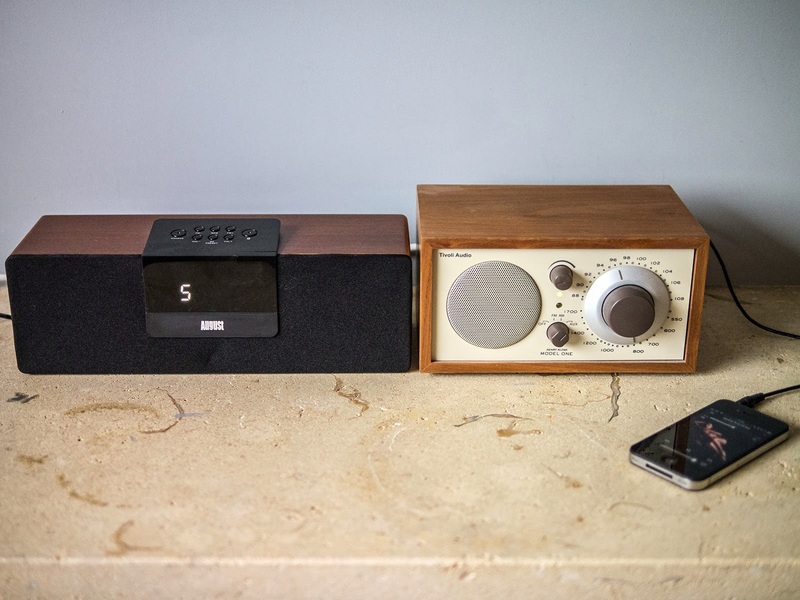 The SE50 also keeps the bluetooth connection if you switch over to radio or aux-input. You have to press the bluetooth button in order to force new pairing or just disable bluetooth on your phone, in order to cancel the connection. All other buttons are in orderly rows which makes them quite hard to operate blindly. The volume buttons are exactly the same size as all the rest and in addition they have the preset button inbetween. The preset button also acts as play/pause button during bluetooth mode btw. But there are no buttons for skipping tracks. You can just pause or resume music directly from the radio. I really would have preferred at least a large rotatable knob at the front, which you could use for adjusting volume and powering on/off when pressed. 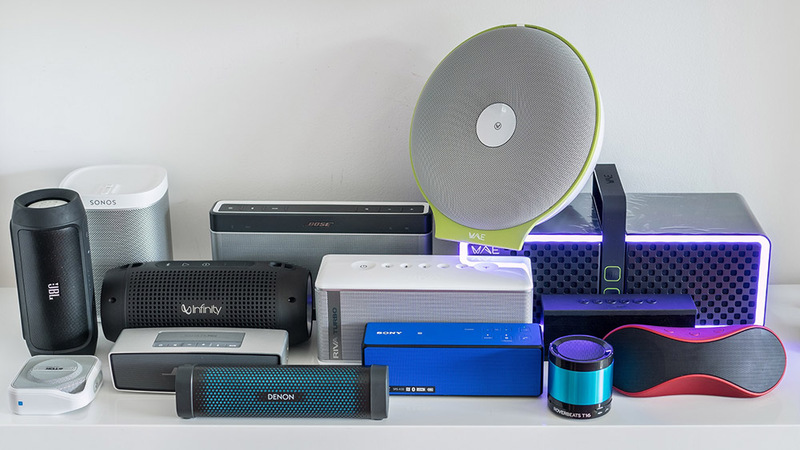 A pity this was not considered for the final design, as it could make the speaker look even more interesting. 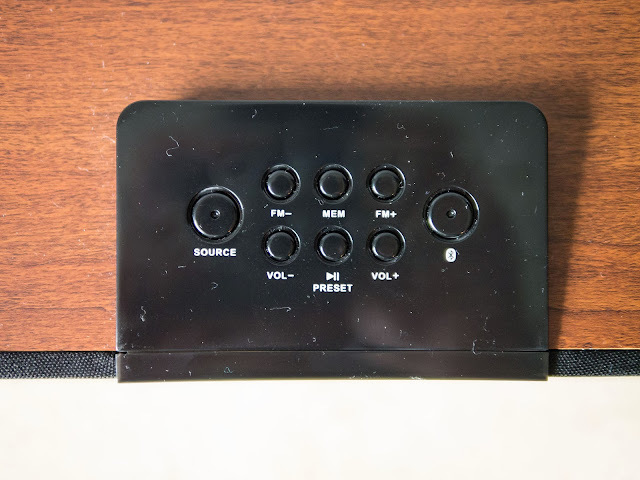 As it is now the speaker rather needs to be placed at lower positions, so that you really see what you press, I would have at least elevated or marked the volume buttons somehow in order to find them because those will probably be the most used. I will show you later why this is a bit of a dilemma, because in reality the SE50 is indeed better suited for elevated places. The first thing I did was of course pairing my iPhone with the radio in order to check its sound with some known tunes and compare it to the Tivoli One. Pairing was fast and without problems and the sound was surprisingly warm with a nice amount of bass, but at the same time lacking a bit of treble-definition. My first impression was that it sounded really veiled, until I found that it improved a lot, if you put the radio at ear-height. The sound seems to be rather directional. As the treble is not very dominant anyway, it becomes even worse if you listen to the radio from above or angled from the sides. This is a pity, as there is no EQ or additional sound control, so that you just have to live with it how it sounds. You can of course add a bit of treble boost, if you use some EQ-app on your phone when connected through bluetooth or aux, but radio sound will always remain a bit dull. Compared to my Tivoli One which is known for not being very bass-shy the SE50 has comparable bass output, but the Tivoli sounds considerably clearer in treble and mids. At the same time the sound isn't that directional and doesn't change that much when listened from the sides. The same goes for the Tivoli PAL which doesn't have the bass-punch of the SE50, but has finer treble and is not that picky where to be placed. Although the SE50 has 2 speakers for stereosound, the separation is not that huge, so you hardly gain any advantage over a mono radio like the Tivoli One, especially when placed farther away. The SE50 can be turned pretty loud. The sound even improves when turned up louder, as it becomes more punchy and powerful. Even at highest levels there was hardly any distortion, only with very bassheavy tracks, but it was still bearable. The Tivoli One can play a notch louder but distorts quite strong at highest levels. I liked the sound of the SE50 more at high levels than on low. Really not bad considering the low price and beating all available small bluetooth boxes costing the same or even twice as much. Thanks to its built in bar-antenna I found the radio reception to be quite good and comparable to the Tivoli One which has the antenna completely integrated, though also has jack for an external antenna. Searching for radio stations is other done manually by pressing the FM +/- buttons until the desired frequency is reached, or the radio searches automatically for the next station, if one of the buttons is kept pressed for a second. Although we only live some kilometers from Vienna, the radio reception is pretty bad in our area. Nevertheless I was able to save some radio stations as presets. By adjusting the antenna a little bit, respection could be improved even further. In summary I have not much to complain about August's SE50 radio. It is really inexpensive, but has a nice warm sound, although a bit treble-shy. But the sound doesn't cause any fatigue even after hours of listening and it can be turned up pretty loud without the sound becoming worse. 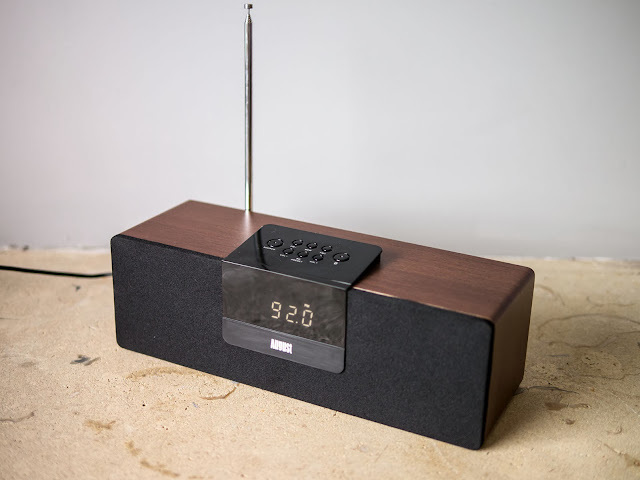 The radio receiver is able to pick up even weaker stations, but most important of all: There is bluetooth on board, which makes it easy to wirelessly connect any smartphone or whatever to listen to your own music or even internetradio. I haven't noticed any hiss or problems with bluetooth and the reach was quite impressive as I still had connection from another room. I would only have welcomed a more conventional user interface, with at least one dominant volume-button. The SE50 is hard to operate if you don't see the buttons. The cherry on top would be of course a simple clock or even an alarm. Are you sure there's no clock? I see clock setup in the documentation.